People may think that working on sea can be cold, windy, wavy, and with hard shifts – sometimes from 00:00 to 6:00 -, and that living on a boat could be, summing up, quite tough. Even though all these ideas might be partly true, after a long day, having the opportunity to see an incredible sunset or a sunrise would make it all worth it! The experience of being so far from everything, to have only the gulls following the research vessel, and to move with the waves is great! It’s an experience that everyone should try once. 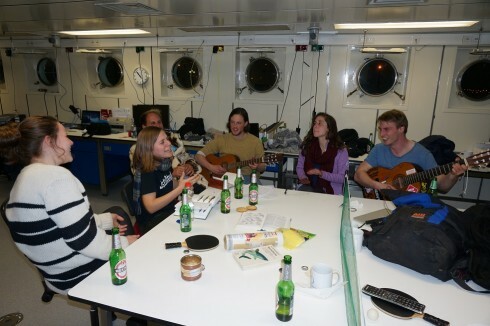 Although we spend most of our time on board with science and fieldwork, we always have some time left to have fun. Learning how to fillet a fish can become the DIY activity of the day which eventually will feed everyone on the ship for the next day. Thanks to our Chef Thomas, who always kindly prepares the most incredible meals, we always have enough energy to finish the hard working days. In order to maintain a good teamwork and to keep the productivity high, it’s very important to take some breaks. Experience has shown that on Alkor you will never get bored! A pair of guitars, a fish book, an after work beer (important German tradition: feierabend bier) and more than anything, motivated people can create hit songs about herrings and sprats! As everyone knows the most famous songs are written in strange situations. Here are some pictures from our cruise that might explain where we got our inspirations for the fishy songs. During our cruise, we had a harbour stop planned for the exchange of the crew members. But due to stormy winds, our short one-day stop at the port of Gdynia, Poland, became a 2 1/2 day stop. So we had to make the best out of it and spend our time with some sightseeing. 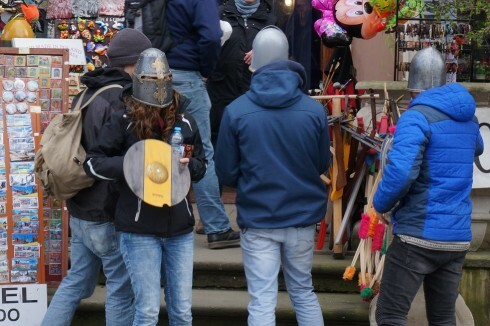 The first day we went to the city of Gdansk, and visited the old part of the city and the dome, and of course we wanted to get the real feeling of the old middle-aged town and yes, the town was prepared for us! On our second day, we rented a car and went to Hel! But don’t worry, we made it back. Because this Hel is actually a peninsula that harbours a national park close to Gdynia, and the name of the local fishing harbor and touristic town. One of our scientific crew members, Paulina, is Polish, and proved to be a fantastic guide, translator and organizer. 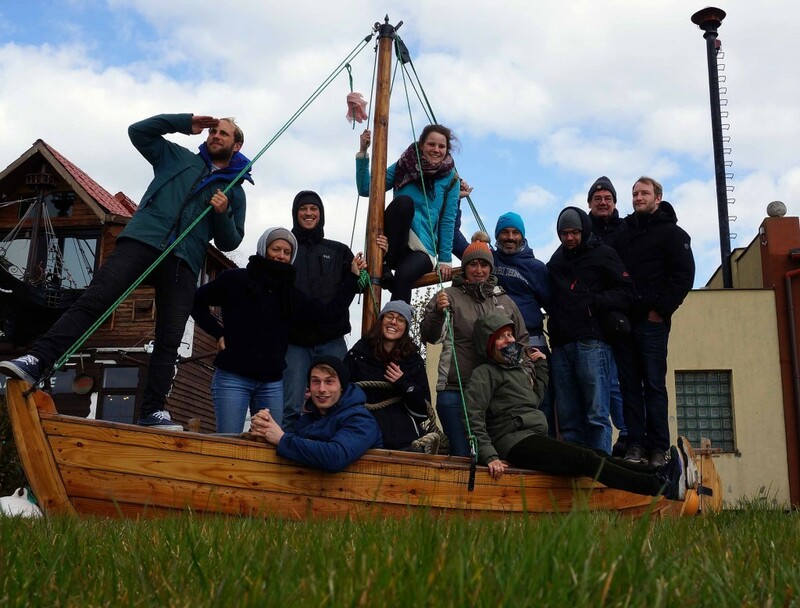 We visited the beaches in Hel, and experienced the sea from a different perspective than normal – working on our last scientific stations before Gdynia Harbour, we actually saw the same beach that we were now standing on from the sea. For dinner, we wanted to try some fresh fish from this port city. Our choice was a small fisherman restaurant – or at least we think so, an old wooden house covered with typical decorations and flowered napkins. 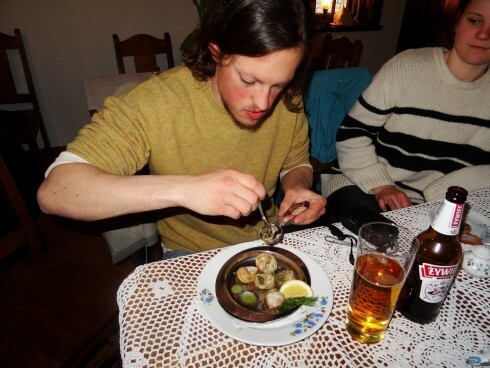 The fish meal was very tasty, but some of us were more experimental and tried the snails for appetizer. 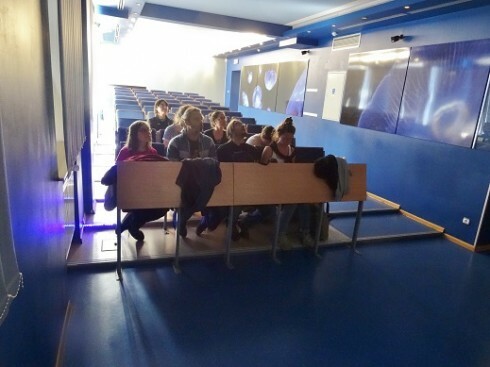 On our last day in Poland, colleagues from the the National Marine Fisheries Research institute of Poland (NMFRI) visited us on board Alkor for a scientific discussion and planning of joint research activities. Piotr Margonski from the NMFRI then gave us a tour of the fantastic Gdynia Aquarium and the institute’s research facilities. After these great days, it was back to sea, and luckily, to some more beneficial weather since then. Dziekuje Poland! As you can see, besides hard work and rough sea we know how to entertain ourselves and be in a good mood to continue our work!